If you are looking for a team of cleaning professionals that can help you keep your home clean and sanitized, leaving you with some much needed extra time, the team at Sears Maid Services can help. Our cleaning professionals work in locally operated teams to provide our residential customers with the right level of maid services for their unique needs. From sanitizing bathrooms and kitchens to removing dust from ceiling fans, our team can offer you regular cleaning services or a one-time cleaning for a special event. Give us a call at (508) 283-2818. If you would like to set up a cleaning schedule so that you can receive regular maid services, our team of professional cleaning staff can help. Sears Maid Services will work around your busy timetable to set up a schedule that works for you. Whether you are looking for weekly, bi-weekly or monthly service, we can help you keep your home clean and sanitized all year round. In addition to our regular housekeeping service, Sears Maid Service also offers a one-time Deep Clean service. You can use our Deep Cleaning service once or twice a year, for example, as a spring and fall intensive clean. We will work on all areas to get your home clean and ready for the upcoming months. When your customers enter your office or retail space, you want them to see a clean and organized office. Cluttered, dirty spaces do not promote confidence when it comes to business. Regular cleaning can also help your staff feel better about the workplace and reduce the amount of time your staff are out sick. The employees at Sears Maid Services have been trained to use the best cleaning techniques to ensure your office or commercial space is cleaned and sanitized. We offer a full range of services including, floors, dusting, bathroom and kitchen sanitation, and trash removal. Whether you are moving into a new home or office or you have recently undergone renovations, there is a good chance that you will have dust and drywall strewn throughout the area. Having a thorough cleaning completed after construction is important for both aesthetics and health reasons. Sears Maid Services has worked on many properties to make sure the home or office is ready to rent or sell. 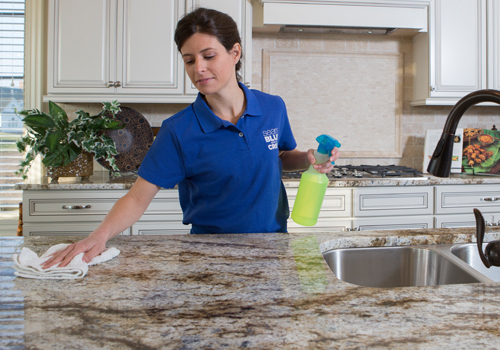 From cleaning floors to sanitizing all exposed areas, our professional team can help. We understand that allowing someone into your home to clean and tidy can leave you with an uncomfortable feeling. We want you to know that each employee we send to your home has been screened thoroughly and that background checks are run on all of our staff before hiring them. We give our staff training to develop the right skills to not only clean your home or office but to act professionally in all circumstances. Each of our staff members has been thoroughly vetted. We offer a satisfaction guarantee because we believe in the services we provide. If you do encounter an issue, you can contact our customer service team within 24 hours of your last cleaning. We will then send out one of our trained associates to inspect the work completed in your home or office, correcting any mistakes made without charge to you.